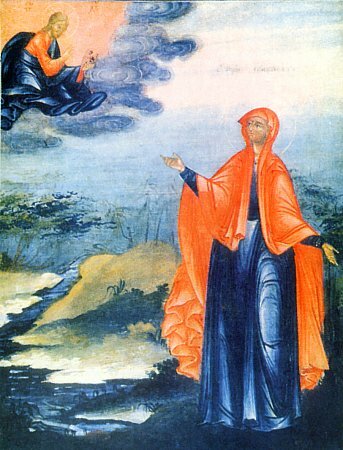 The Nun Elizabeth the Wonderworker was chosen to the service of God while still at birth. It was revealed to her mother, that the girl would be a chosen vessel of the Holy Spirit. In childhood the parents gave off their daughter to a monastery. She grew up in fasting and works and received the gift to heal infirmities not only of body, but also of soul. The sisters chose the nun to be hegumeness. The nun wore the attire of a coarse hairshirt. Her body withered, but her spirit blazed with the flame of Divine Love. The abstinence of the saint was immeasurable: for many years she ate only grass and vegetables without bread, and wine and oil she did not partake of. Many a time the Nun Elizabeth passed the whole of the Forty-Day Great Lent, partaking of nothing at all. Imitating the Publican in humility, for three years she did not lift up her eyes to the heavens, but with her spiritual eyes she looked constantly to God. At the midnight prayers the nun was alight and illuminated by Heavenly Light. Many miracles were done by the nun: a vicious viper was killed by her prayer, she healed a woman with issue of blood who had been for many a year sick, and she cast out unclean spirits from people. Upon her death the grave of the Nun Elizabeth likewise gave forth healings from illness. Even the very dust, taken from over her relics, gave the blind to see.